Take a look at a darker recommendation from Jasmin at Jasmin Reese Interiors. In light of the recent Halloween and Día de los Muertos holidays, we had to opt for black for November’s color. Beyond its reputation for being spooky and serious, black is universally known for being dressy and chic, it works beautifully with both classic or modern looks, and it is endlessly versatile. See what black can do! Black is very edgy, even to the point of being extreme, so it must be used thoughtfully and is certainly not for everyone’s taste. However, the color is unmatched for its drama and its ability to make other colors pop! A great place to start incorporating it into your home is to paint some black accents, such as windowsills or trim, or replicate this simple black door to add elegant definition and style to a clean, minimal entryway. Interior renovation of Spanish Town historic residence completed by Ty Larkins Design, Baton Rouge, Louisiana. 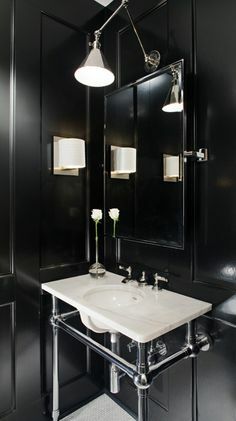 If you’re ready for a stronger commitment to black, you can paint the entire walls in a smaller room, such as this Hollywood-style powder room. The glossy jet black paint brings oozes of luxury and class to the panelled walls. And here’s a little-known design pro tip: black can actually make a small space feel larger. In my own small city apartment, I painted the living room walls a deep plum color to see if we could amp up the spaciousness and it worked wonders! This dining room featuring partially-black walls is incredibly successful. The sleek black color above the white wainscoting and the white tulip dining table deliver mod sophistication to the space, while the vintage Turkish rug and leather upholstered dining chairs warm up the room and bring a classic touch. If you're ready to go the whole nine and paint one of the principal rooms in your home black or near-black, we don’t think you’ll regret it! Just like pure white walls make a nice blank canvas for other decor and accessories, black is also the perfect background for any artwork. The black wall set back between custom bookshelves in this library makes a stunning backdrop for a big bold painting. Combining black, gold and white for the ultimate sophistication, this luxe library is completed with a pair of gorgeous black bookcases that beautifully highlight treasured books and white marble sculptures. Need help finding just the perfect way to work black into your home? Call us for a free color consultation.